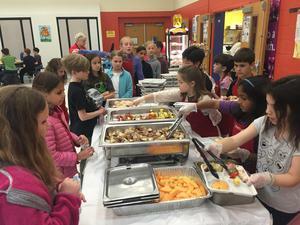 Many schools across the country are applying organic principles to the three core elements of farm to school - local food procurement, schools gardens, and food and agriculture education - in a number of ways. This new fact sheet from the National Farm to School Network shares keys to success for integrating organics in farm to school practices and highlights three case studies of school districts finding success with organic practices, including Hopewell Elementary School. 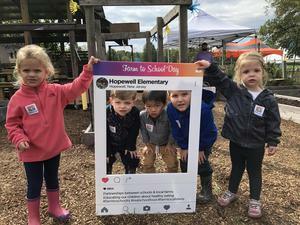 Hopewell Elementary School has received the 2018 Best in New Jersey Farm to School Award from the Department of Agriculture. We were honored to receive this prestigious recognition on September 24th which was presented by Douglas Fisher, Secretary of Agriculture. This Sustainable Jersey/NJEA grant will expand the vertical farming initiative at Hopewell Elementary School with the goal of becoming a self-sustaining farm supplying lettuce and other vegetables, herbs and edible flowers to our cafeteria. Congratulations to Mrs. Corveleyn on securing another grant to support our students! Hopewell Elementary School holds an annual Day of Service on the Friday before the Martin Luther King Jr. holiday weekend, joining a tradition of honoring this holiday as a time of service to the community. Each grade level at HES supported a community service partner by engaging in a hands-on project to benefit their organization. We had a record number of parents join us this year.